Speed up the heeling process of plantar fasciitis with this low profile, thermal lined bootie from Swede-O. The PF FXT allows you to sleep comfortably while gently stretching out the plantar fascia, the band of connective tissue that runs from the heel to the toe. Slip on the bootie and adjust the dorsal flexion (amount of tension) to pull back the toes towards the ankle. 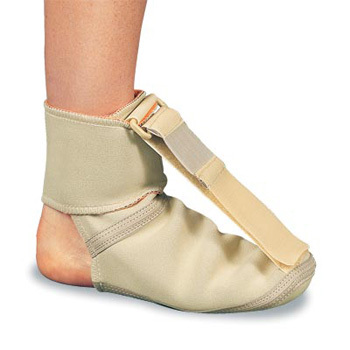 Not nearly as bulky as other night splints plus this item has a slip-resistant sole.